Each and every app that you have on your Android device (either because it was pre-installed, or you've installed it yourself at some point) can misbehave. Quite often, apps don't work as they're supposed to because temporary files are misbehaving. In this case, if you clear the app's cache, you'll likely get rid of the problem. You can clear an app's cache from your Android device's Settings menu. Go to Settings -> Apps to find the application that needs to be fixed. Once you've found it, simply tap on it. You'll then get a screen with various options, with Clear Cache being among them. Tapping on the Clear Cache button removes all temporary files associated with the app, thus probably solving the issues you're having. If clearing cache doesn't solve the problem, you can also try to Clear Data (this button is just above Clear Cache). However, you must keep in mind that this removes your personal settings, accounts, and files associated with the app, so it's somehow like you're reverting to the original installation of it (you're warned about this thing when you tap on Clear Data, just in case you're doing this by accident). P.S. : while this tutorial was done using stock Android 5.0 Lollipop, the process of clearing app cache and data is similar on older versions of Android. From here, scroll down until you find the Apps sub-menu. Let's say Google Play Music is misbehaving and you want to clear its cache. Just tap on the app. Access your main Settings menu. 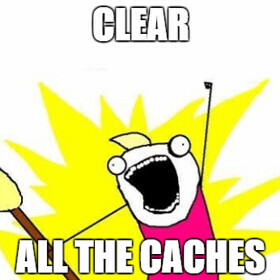 Now, tap on the Clear Cache button, and you're done. You can return to your home screen, or to whatever you were previously doing. If you want to clear an app's data, you have to tap on the respective button, then confirm that you really want to do this. You guys hired writers for this?